The Persian cat was brought to Europe in the 1600s from Persia, presumably feeling right at home on a cartload of jewels and fine silks. Perhaps because of this decadent lineage, the cat became a fashionable favourite of Queen Victoria. Today, the Persian is one of the most popular cat breeds in the world. The Persian cat is often described as a piece of art, and you can’t deny this breed is truly striking. It has a beautiful, long coat and its proportions seem to have been designed to emphasise its delightful fluffiness - this cat is as round and stout as it gets. It has a big, round head head with wide-spaced eyes, a broad chest and short legs. For reasons that, frankly, elude us, many Persians have been bred with an extremely flat face. However, this is known to cause health problems and a longer muzzle is better for your cat. And, as we all know, what’s good for your cat is good for you. Persians come in virtually any combination of fur colour, eye colour and coat pattern, and listing them all here would test your patience. Persian cats are very placid, happy to sit on your lap or their favourite item of furniture for hours at a time. They are excellent apartment cats and are content being left alone, to greet you warmly when you return. They are affectionate cats but are known to be fussy with strangers, who will have to win your cat’s trust through complex ritual, or simple kindness. More than other breeds, they cherish quiet and routine and although they are gentle-natured - unlikely to ever scratch - they may not get along with especially playful children or dogs. The Persian’s coat doesn’t stay luxurious on its own. We recommend daily combing, along with the usual grooming that happy, healthy cats require. Make sure to clean your cat’s eyes regularly and give it the occasional bath. As fussy (and fuzzy) as this cat can be, it is also important to keep a clean, spacious litter box. The flat face of some Persian cats can cause health problems, including: difficulty eating, difficulty breathing, overflow of tear ducts, dental problems and entropion (where the eyelids turn inwards, rubbing against the eye and causing pain and cornea damage). This breed is also more susceptible to polycistic kidney disease, leading to excessive drinking, urination, reduced appetite, weight loss and depression. 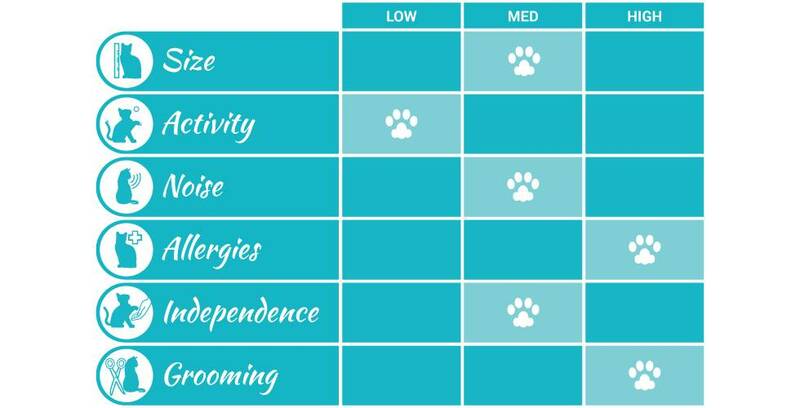 Although a responsible breeder will screen for this condition, take your cat to the vet if it has any of these symptoms. Hypertrophic cardiomyopathy is also hereditary in this breed and you should maintain regular check-ups. However, note that the risk of disease is nowhere near a certainty: a well-looked after Persian will be a loving companion for 12 to 17 years. There’s no way to spin this - if you’re allergic don’t get a Persian cat. Instead, scroll to the picture above and think of what could have been. Or, better yet, look into some more allergy-friendly breeds. If you still need convincing, let us help you fall in love with the Persian; or maybe you want a lower-maintenance kitty? It’s okay, we won’t judge. Find the cat that’s right for you here.